Most seasoned Great Lakes steelheaders will tell you that locating steelhead (aka -“the hunt” or “chasing chrome”) on their migration from the lakeshore in the early fall (and up the tributaries through the fall, winter and early spring) plays a big part in “hooking-up” with them on a consistent basis. Once located, the specific steelhead holding location and ongoing water conditions will determine what techniques, equipment and flies will be the most effective. Prior to running into the tributaries in the early fall, Great Lakes steelhead begin to stage along the lakeshore at or near a tributary mouth. Shortening photo-periods of daylight, dropping lakeshore temperatures (68 degrees F) and the out-flow scent of a tributary (namely the specific tributary the steelhead has smoltified in as juvenile) draw steelhead close to shore. At this time, target steelhead at the mouth, along the beach (particularly in the wind blown direction of the tributary out-flow) and along piers, break walls and marina walls. 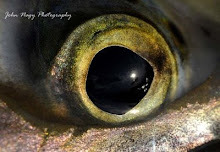 Steelhead are extremely light sensitive at this time but will cruise amazingly close to the shoreline particularly in the low light conditions of dawn and dusk. Fly casting and strip retrieving baitfish patterns is very effective for cruising “pods” of lakeshore steelhead. 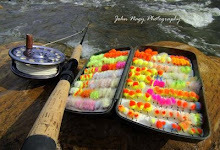 Indicator fishing with bead-head nymphs, egg patterns and small streamers and wooly buggers is possible at the out-flow of the tributary mouth’s. Here a limited current flow exists to move an indicator along. Look for washed out gravel channels and pockets where staging steelhead move in and out of. Lake shore steelhead also like to hold along “current breaks” (to be discussed in detail later) created by concrete breaker-walls, marina walls, broken debris and other structures. A cool fall rain, along with decent run-off, triggers the initial runs up into the tributaries (ideally 54 degrees F or less). Since many Great Lakes tributaries are free flowing and are at the mercy of run-off from rainfall, marginal run-off can limit early fall steelhead runs to the mouths of the tributaries, with a scattering of fish working their way up to lower to mid sections. Steelhead will not run far in extremely shallow water since bedrock, shale and gravel can irritate their bellies on their upstream movement. Also, it is not unusual for early fall steelhead to migrate from the lower reaches of a tributary back to the lakeshore (especially when in close proximity to the lake) when water flows become exceedingly low and clear. A good strategy early in the fall, when run-off is limited is to target damned rivers like the Salmon and Oak Orchard River’s in NY which have power generating/controlled releases that guarantee minimal base flows and allow for more reliable early runs. Large tributaries like Cattaraugus Creek in NY and the Grand River in OH have damned flows (but do not allow for minimal base flows) so fall flows can be a problem as well numbers and distance of running fish. Once fall run-off becomes consistent, steelhead can quickly “run” up a tributary. Since the majority of spawning will occur later in the winter and early spring, this pre-spawn movement is characterized by steelhead finding periodic resting areas on their upstream migration eventually holding or “wintering over” (below 38 degrees F) for longer periods of time in deep pools and runs, deep pool tail-outs and back-eddies. Steelhead normally will hold just above the stream bottom. They resist fighting the main current (particularly as water temperatures drop in late fall to the 38-45 degrees F range) and will use sub-surface current breaks in the current flow to rest in (typically resting on the “slow side” of these breaks). Current breaks create reductions in the main current speed (both in the vertical and horizontal directions) and are made by both natural and man-made stream structures. Steelheaders can detect these breaks by observing water surface texture changes that can vary from the obvious to subtle. (Refer to John Nagy’s Steelhead Guide Book for diagram showing the relationship of current breaks, water surface texture variations and steelhead resting areas in a typical stream flow). Classic steelhead resting areas can be found along streambed shale ledges and bridge abutments, behind pocket water boulders, in streambed depressions and cuts, adjacent to “current seams” located in pools and runs and in pool tail-outs and heads. Changing water temperature and flow will effect the exact position of steelhead at these resting areas (as well as their receptivity to take a fly). Resting steelhead strike flies out of an instinctive “feeding response” developed while in the lake but do not require any sort of sustenance to complete their spawning run. In fact, steelhead in their native range of the Pacific Northwest can travel hundreds of miles (for months) to get to spawning gravel without food. This ensures that successful spawning (and survival of that specific steelhead strain/run) is totally independent of any food source. Once in the tributaries, steelhead transition metabolically from a feeding/growth mode to maturing sexually and production of sperm and eggs. Literally all their energy is being directed toward sexual reproduction with feeding (for growth purposes) not a priority. Steelhead are especially cooperative fly takers when water conditions are right. Water temperatures above 40 degrees F keep steelhead active and some sort of stain to the water gives fly patterns an ambiguous look (which perks the curiosity of steelhead). The type of steelhead resting area will determine the most effective technique and flies to use. For wide/long pools and runs with fairly even bottoms and medium depth, “swinging” streamers, tube flies, spey flies, soft hackles and intruders “through” current seams can initiate some explosive strikes from aggressive steelhead. In “tighter” areas like along shale ledges and downed timber, behind boulders, in streambed depressions and smaller pool tail-outs and runs, dead-drifting egg patterns and bead-head nymphs (using a floating indicator) is extremely effective. Another priority for migrating/pre-spawn steelhead is to find cover from predators. The primary way they find this in a tributary is to use water clarity (or the lack of) to their advantage. They feel very secure in shallow current flows as long as the water is substantially stained to conceal them (moving to deeper water as water clarity improves). An exception is the broken water surface texture provided by fast current flows. These surface riffles can provide sufficient cover for resting steelhead even in shallow/clear water flows. Downed trees and stream bank under-cuts are also favorite haunts for steelhead to avoid predators. Streambed structures (as described earlier) also provide good cover for steelhead seeking concealment from predators. Steelheader's Tip: Look for dark areas in shallow runs and pocket water. Steelhead often hide there, using their grayish/black backs as concealment against the dark streambed. 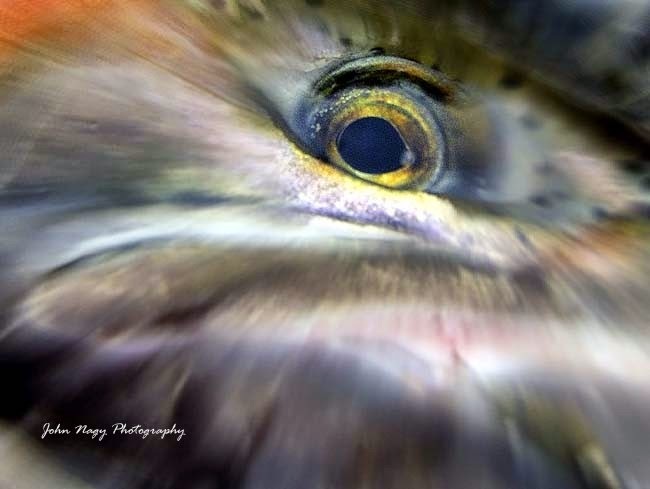 As photo-periods become longer in late winter and early spring, and stream temperatures begin to consistently rise to 40 degrees F and above, steelhead begin to move onto shallow spawning gravel areas or spawning beds. For the first time since entering the tributaries, steelhead seem to ignore their previous aversion for bright light and predators and can be readily seen (in both stained and clear water) going through spawning rituals. If water temperatures drop markedly, steelhead will relocate off the beds to nearby deeper pocket water, undercuts, runs and heads of pools. These areas can also hold fish that have been spooked off their beds (by fisherman) as well as pre-spawn and spawned-out (post-spawn) fish. Steelhead have a strong territorial/protective response when on the beds and will strike (particularly the males) both dead-drifted and swung presented patterns. To avoid accidentally snagging fish visually look for strikes during dead drifts and always keep swung flies above the steelhead on the beds. (Note: Fishing steelhead spawning beds on rivers with documented natural reproduction is not recommended). Post-spawn steelhead have been through the gauntlet (river running, insane water conditions, fishing pressure, predators, wintering-over, weight loss, spawning) and show a lot of wear and tear to say the least. They develop voracious appetites and a powerful urge to move back to the lake (steelhead do not die after spawning like salmon and a good percentage will return to spawn again). Large numbers of “drop-back” steelhead can be found in the lower reaches of the tributaries (especially on the bigger ones) in mid to late spring. Swung baitfish patterns are deadly for these hungry fish. Most steelhead will start exiting the tributaries for the lake when water temperatures get above 70 degrees F. Steelheaders should be aware that steelhead are highly stressed when tributary water temperatures are above 70 degrees F and should not fish under these conditions to prevent possible fish mortality after playing and landing fish. More detailed information on fly fishing for Great Lakes steelhead can be found in John Nagy's classic book "Steelhead Guide, Fly Fishing Techniques and Strategies for Lake Erie Steelhead." 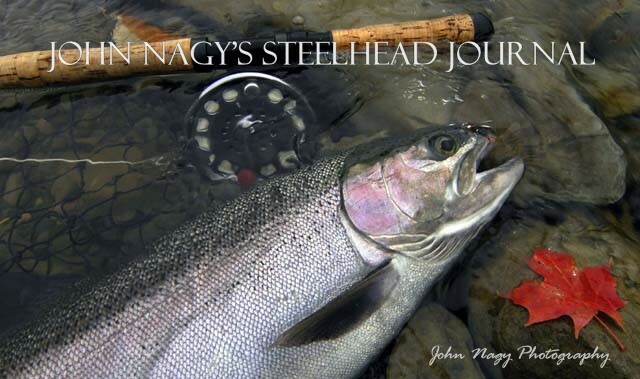 John Nagy's "Steelheader's Journal" makes a great companion book to the Steelhead Guide for Steelheader's looking to keep track of their steelhead trips in steelhead alley. Please go to the right side-bar for ordering information for these books.